The dangerous conditions on Monroe have led to two fatalities on the quarter mile section of the street in VaHi the last year. That is two deaths too many. The best way for each of us to improve the safety on Monroe is to attend the February 28th Renew Atlanta Meeting on the Monroe Complete Streets Project and demand that a road diet be implemented on Monroe from 10th to Piedmont. (Tuesday, 2/28 6:00 – 8:00 Big Bethel AME Church, 220 Auburn Ave NE, Atlanta, GA 30303). How will a Road Diet improve conditions on Monroe? 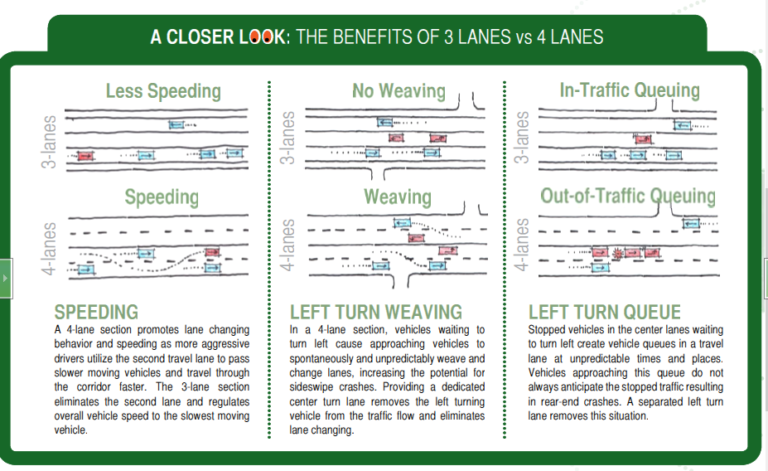 It may seem counter-intuitive that reducing lanes could make a street better, but there are real-life examples from throughout the country that show that road diets not only reduce crashes by up to 47%, but also improve traffic flow. Indeed, a study on the Ponce de Leon road diet found that after the road diet was implemented, there was a 25% decrease in overall crashes, with morning travel times decreasing by almost a minute and afternoon travel times increasing by only a bit more than a minute. A road diet for Monroe isn’t a new concept – it has been part of the BeltLine Plan, the Connect Atlanta Plan, and the Virginia-Highland Master Plan. And although the Monroe Road Diet has been a part of these comprehensive plans, and is a proven way to improve safety and traffic flow, there are still skeptics. Some are fearful that it will lead to cut-through traffic. Cut-through traffic, however, is a problem now. Keeping Monroe as-is will not improve cut-through traffic. Improving traffic flow on Monroe and eliminating the conditions that have led to fatal crashes should actually help with cut-through traffic, not make it worse. Others have insisted that temporary measures such as increased police enforcement, or measures that may reduce speed such as speed humps, will be sufficient. That is simply not the case, because even if speed is reduced, the weaving in and out to avoid the left-turn queue still creates dangerous conditions for both vehicles and pedestrians. The road diet is the best and only solution that will provide 24-hour-a-day improvements to safety on Monroe by slowing traffic, eliminating weaving in and out to avoid the left turn queue (and thereby improve traffic flow), eliminating the left-turn blind spot caused by the lack of a dedicated left-turn lane, allowing pedestrians to safely cross three lanes of traffic instead of four with a “safe haven” in the middle provided by the dedicated turn lane, allowing bikes to travel in dedicated bike lanes away from traffic, and making sidewalks safer by having them bordered by bike lanes instead of speeding cars. Neither increased police ticketing nor speed humps can provide 24-hour-a-day improvements to all these safety issues. What if the Road Diet doesn’t work? In December, the project manager for the Monroe Complete Streets Project attended the Virginia-Highland monthly meeting and announced that the traffic counts for Monroe were within the acceptable limits for a road diet. Thus, there is no reason for there not to be a road diet on Monroe. 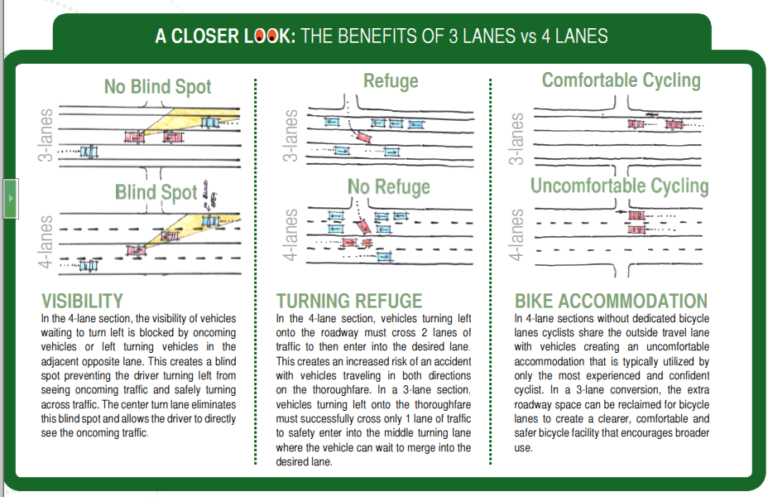 Nevertheless, if the Monroe road diet is somehow different from the hundreds of other successful road diets that have been implemented throughout the country and does not improve the dangerous conditions on the street, the “diet” can be undone by simply re-striping Monroe and converting it back to four lanes. What Can I Do To Improve Safety on Monroe? The best way to improve conditions on Monroe is come to the February 28th meeting and show your strong support a road diet on Monroe. We must stand together and demand the proven and permanent safety improvements of road diet for Monroe. We as a community cannot tolerate any more fatalities on this broken street. The Road Diet is a key component of the Complete Street project. The full name of the Monroe project is actually the Monroe/Boulevard Complete Streets Project. The project is being funded by the Renew Atlanta Infrastructure Bond that was approved by city voters in 2015. “Complete Streets” are designed to enable safe access for all users – pedestrians, bicyclists, motorists and transit users. Complete Street projects implement comprehensive design changes including light synchronization, intersection realignments, and landscaping, lighting, and crosswalk improvements. They often also include traffic calming measures and design changes to make streets safer. The Master Plan contains more details, and pages 81 on are especially pertinent for the Road Diet. Note: This is a large file and may take a little while to load. This entry was posted in news, Uncategorized and tagged road diet by Stephen Cohen. Bookmark the permalink.